One of the first meals I ever made was chile verde. That was almost 14 years ago, and I have been learning how to make new meals every since, but chile verde has always been one of my favorite dishes, and still is to this day. Chile verde is usually a stew, and I make it with pork, green chile and a blend of spices, but I have found when I reduce it down with a slurry, it creates a phenomenal sandwich filling! 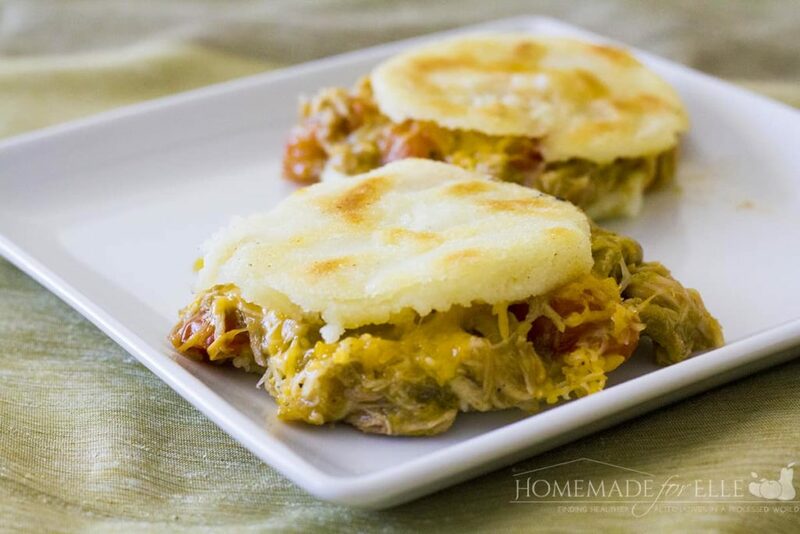 And speaking of sandwiches, I recently learned about arepas, a flatbread made with ground cornmeal. They’re quick and easy to make, and they’re so versatile, your family will love them! I am seriously obsessed with them. I have actually been making a lot of delicious meals that were inspired by a new staple ingredient that I have in my home: P.A.N. cornmeal. It isn’t surprising, considering P.A.N. cornmeal has been around for years, and is the number one cornmeal in South America. It’s recently made its way to the U.S., due to its versatility and rich nutrients, that makes it a world-wide favorite. If you want to discover more recipes using P.A.N. Cornmeal, check out their Tumblr page. 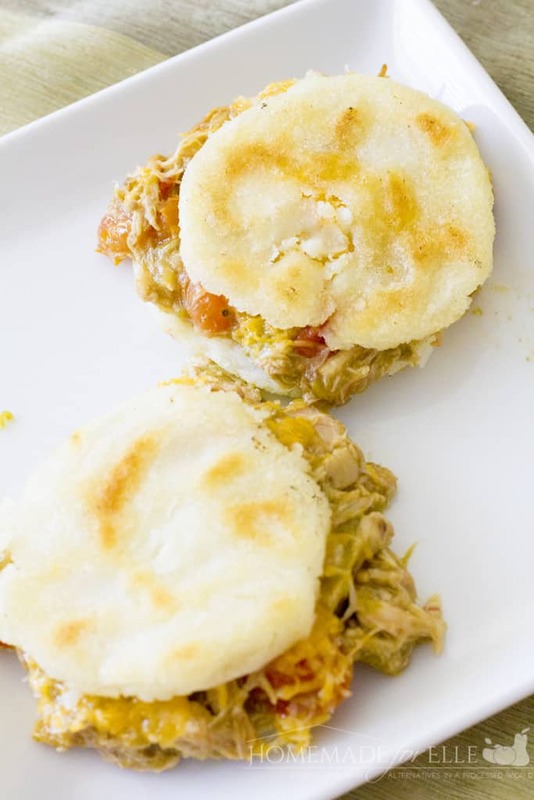 But back to the arepas… I filled them with my chile verde mixture, and they have become one of my top 10 favorite things I have ever made. The chile verde filling makes a wonderful complement to freshly-made arepas, especially when you top them with some colby-jack cheese. If you love Mexican food, you will absolutely love this. To make the chile verde: Combine pork roast, chicken broth, cumin and garlic in a crock-pot, and cook on low for 6 – 8 hours, until cooked through and tender. Use a fork to shred the pork, and transfer the pork and 2 cups of the broth to a pot. Warm roast over medium heat, add in cherry tomatoes and green chile, and simmer for 10 minutes, or until tomatoes soften. Combine 1 tbsp of cornstarch with a tablespoon of water, and whisk. Add the cornstarch/water mixture to the roast, and stir. You will see the chile verde mixture thicken up within a minute. Add more cornstarch/water mixture to thicken it, if necessary. To make the arepas: Add 2.5 cups of water to a large bowl. Slowly add in 2 cups of cornmeal, stirring well to form a dough. Season with a teaspoon of salt. Knead for 3 minutes. Divide the dough into 10 equal sizes. Warm a couple tablespoons of olive oil in a pan over medium heat. Roll one of the arepa dough into a ball, and then flatten into a round disc with your hand, making it about 1/2″ thick. Repeat with remaining arepa dough, and place half of them into the pan. Cover and allow them to cook for 6 – 8 minute or until golden brown. Remove the cover, flip the areaps, replace the cover and cook on the other side for 6 – 8 minutes. 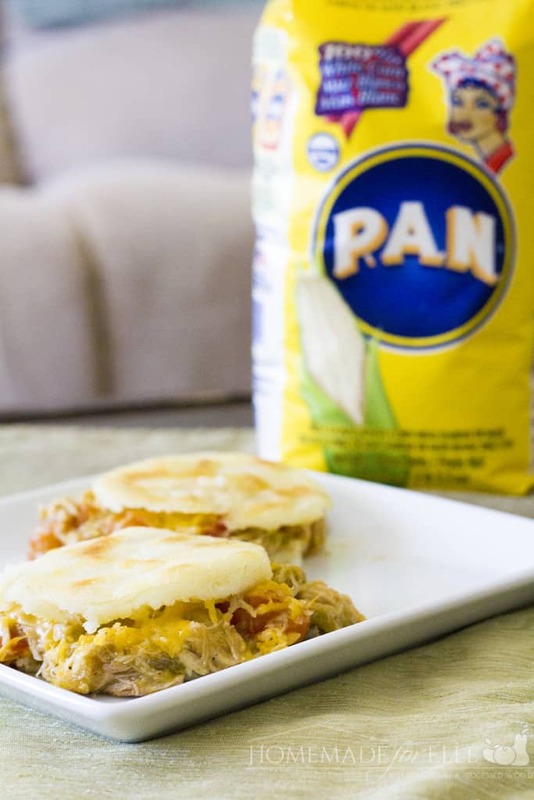 Once the arepas are cooked, cut in half, spoon in the chile verde mixture, top with cheese, and enjoy! To make the chile verde: Combine pork roast, chicken broth, cumin and garlic in a crock-pot, and cook on low for 6 – 8 hours, until cooked through and tender. Use a fork to shred the pork, and transfer the pork and 2 cups of the broth to a pot. Warm roast over medium heat, add in diced cherry tomatoes and green chile, and simmer for 10 minutes, or until tomatoes soften. Combine 1 tbsp of cornstarch with a tablespoon of water, and whisk. Add the cornstarch/water mixture to the roast, and stir. You will see the child verde mixture thicken up within a minute. Add more cornstarch/water mixture to thicken it, if necessary. No chile involved?? Gotta have some green chile. Charles – wow, I missed the green chile in the recipe! Yikes!! Thank you for pointing that out, I am adjusting the recipe now. 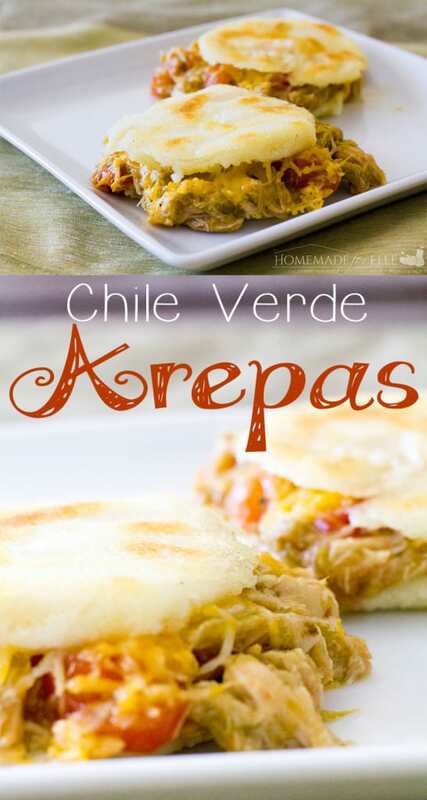 Green chile certainly needs to be present in Chile Verde Arepas!